Scientists from the University of Prince Edward Island, Memorial University of Newfoundland, and aquaculture feed manufacturer EWOS/Cargill are meeting this week in Charlottetown to launch a new $4.5 million project to develop better therapeutic diets for farmed Atlantic salmon. 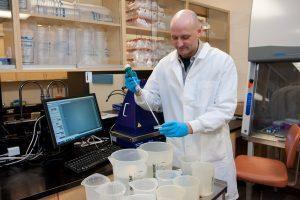 Animal and fish health are a key area for PEI’s thriving bioscience sector. Through this pioneering project, Prince Edward Island is well positioned to be part of the next big breakthrough in therapeutic diets for farmed fish. Growing healthier fish could save the Canadian aquaculture industry up to $57 million dollars a year while reducing the need for additional treatments to help keep the fish healthy. It’s a win-win for fish farmers, consumers, the economy, and the environment. The project, managed by Genome Atlantic and funded in part by the Government of Canada via Genome Canada, is studying co-infections by multiple pathogens like sea lice, bacteria, and viruses – something that can happen during a disease outbreak in Atlantic salmon. This will allow EWOS/Cargill to develop therapeutic formulas that will combat, reduce, or prevent co-infections, potentially cutting fish losses by up to 20% overall and 50% for some diseases. To help guide this complex research, the scientific team is using genomics, a powerful combination of genetics, biology and computer science that unlocks the mysteries found in every living thing. More commonly associated with human health in terms of enabling earlier diagnoses and more personalized treatment, genomic technologies are relevant to many other sectors including aquaculture, agriculture, mining, energy, and forestry. This broad bandwidth of application spanning seven sectors will continue to play a pivotal role in the overall growth of our bio-economy. In the context of the salmon co-infection project, the team will use genomics technologies to identify the presence or absence of infecting organisms based on their DNA fingerprint, while also monitoring the genes involved in the salmon’s immune response. More broadly in the aquaculture sector, advanced genomics technologies are also helping local aquaculture companies develop enhanced breeding programs for finfish and shellfish alike, by allowing them to select for elite performance in terms of growth rate, disease resistance and tolerance to changing water temperatures. In the agriculture sector, a huge part of Prince Edward Island’s economy, genomics technologies are leading to increased crop yields, plants that are more drought resistant and pest resistant, and a reduction in the need for chemicals. These technologies also have applications in the dairy industry by helping regional farmers evaluate the accuracy of genomic profiling as a prediction tool for future milk production. Beyond applications in human health, agriculture and aquaculture, genomics technologies are also helping local companies fine-tune their environmental monitoring techniques by identifying select microbes capable of cleaning up contaminated industrial sites. Similar techniques are also being used to identify the presence of certain marine bacteria associated with hydrocarbons, with the aim of de-risking offshore oil and gas exploration in Atlantic Canada. Genome Atlantic works with an array of companies, researchers, government departments and innovation agencies to ensure these leading technologies bring tangible benefits to Atlantic Canada. This includes the generation of economic benefits in parallel with capacity building at our local universities. UPEI is a key partner in the salmon co-infection project – a testament to the outstanding research on aquatic species health conducted at the Atlantic Veterinary College. This work, including the research on fish health led by Dr. Mark Fast, is advancing the science of aquaculture in Atlantic Canada toward a more sustainable future. We thank our many partners spanning seven sectors for their growing commitment to help position Atlantic Canada as a leader in genomics-driven bioscience research and development – an area that is increasingly important to our region’s health, well-being and prosperity. Steve Armstrong, President and CEO, Genome Atlantic, a not-for profit corporation that helps Atlantic Canada reap the benefits of genomics and other ‘omics technologies.